Banyan Tree Phuket is ideal if you are looking for more of an intimate stay, but would still like to have resort facilities close by. Stay in one of the many villas where you will enjoy a private pool and decking area, making your stay intimate and special. 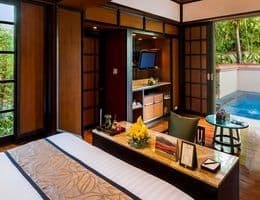 A luxury resort in Phuket Thailand, the Banyan Tree Phuket is ideal for gay and lesbian couples looking for an intimate getaway with all the trimmings of pampering and luxury. Head to the spa for world-class experience and allow yourself to relax and rejuvenate which is essential whilst on holiday. There are several unique dining experiences for you to try, including Banyan Tree’s very own Sanya Rak Dinner Cruise. The serene location of this villa makes you feel closer to nature like never before but still provides you with a luxurious experience. The-Thai inspired decor and spacious layout means your stay will always be comfortable. With an authentic Thai design, these villas provide a very comfortable luxurious experience. The private pool and outdoor terrace overlooks the stunning lagoon. The open-air oval bathtub provides a pleasurable bathing experience. The decor is the epitome of refinement and elegance. Enjoy the panoramic views of Bang Tao Bay from your very own pool. The outdoor area is flooded with fragrant tropical greenery so imagine yourself enjoying a delicious barbeque on a hot sunny day. The bedroom is beautifully designed and the en-suite bathroom includes a separate bathtub and shower. A quaint garden path leads you to your private decking area. The private pool is the perfect place to cool off in. the bedroom has doors which open out onto the terrace area and allow plenty of natural light to flood the room, creating a lovely ambience. The lavish living area is a great place to relax in and the spacious bathroom is finished to a very high standard. This two bedroom villa comes with a fully equipped kitchen, spacious dining and living area and a beautiful private pool for you to enjoy. Luxury is a must in these villas, which is why the attention to detail is incredible. The authentic and modern style combination makes these villas comfortable yet stylish. If you prefer to stay in the comfort of your own villa, you can simply arrange for your meal to be served on your very own dining table. Order from the extensive menu which is available 24/7. This is Banyan Tree’s signature restaurant and offers traditional Thai cuisine at its finest. This restaurant has taken classic recipes and added a modern twist to them making your dining experience exciting and packed full of flavour. This casual bar is the perfect place if you are looking for a casual drink. The bar is open from 10 am to 6 pm. This river cruise is ideal if you are looking for a special romantic night. You and your partner will experience melt in the mouth food whilst cruising along the beautiful river and watch the breathtaking sunset. From Thai massages to holistic treatments, this spa has it all. Immerse yourself in a whole new world and let your mind body and soul sink into paradise. You can arrange to have a treatment in the comfort of your own villa or suite. The resort also hosts yoga sessions on the beach.